A Seriously Inappropriate Ad Shown Here! 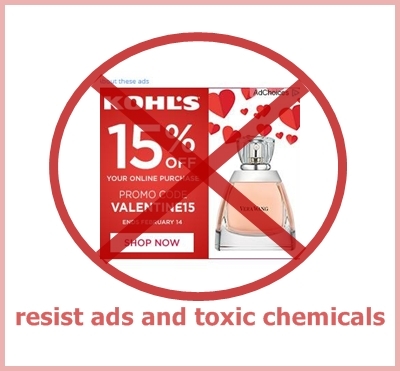 I was informed by someone that they saw this seriously inappropriate ad from KOHL’s, selling perfume for Valentine’s Day, on one of the posts they read on this blog!!! I have no control over what ads get shown here, I don’t even see them! If anyone ever sees an ad like that here again, please let WordPress know that it is seriously inappropriate for them to place ads for things made of toxic chemicals on this site (if you are new here, look around, and you’ll see why)! Resist toxic chemicals everywhere (and not just in fragranced products)! This entry was posted in Environmental Health, Fragrance and tagged bad ad, health, MCS, petrochemicals, phthalates, sensitive to pollution, toxic chemicals, toxic trespass. Bookmark the permalink. I don’t see ads on your site. I think it is entirely random. I wonder what ads have shown up on my site? It was nice that it was pointed out to you so that you could discuss what actions to take to rectify it. WordPress doesn’t show us ads when we are signed in to WordPress, we have to sign out to see them. I don’t know why they do that, I’d really like to see what they are putting up here without having to sign in and out. Thanks.I knew I needed to do that for my site but not everyone else’s. Happy Valentine’s Day. May loving kindness permeate the world, on Valentine’s Day, and every day! Could we wish for a better day than that where everyone feels love and kindness toward everyone.